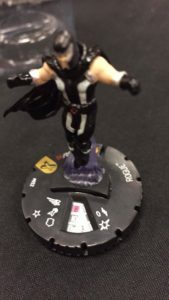 The Uncanny X-Men is the latest expansion to the HeroClix world and was released yesterday (May 4, 2016). Like so many others, I arrived at my LGS right around opening time to pick up my brick. This set also introduces FX Bases, which is a pretty cool addition to some of the characters traits, (more about these below). This set consists of 70 individual pieces, a Fast Forces pack featuring the All New X-Men, and a prize support piece featuring Professor X. The rarity in this set breaks down like this: 16 Common (plus one Prime), 16 Uncommons (plus one Prime), 16 Rares (plus one Prime), 12 Super Rares (plus one Prime), and 6 Chase figures. In this release, we have some new sub-themes that include Marauders, All New X-Men, and Freedom Force. The Marauders have always been one of my favorites, so I am very excited to see an updated version in game. The original Age of Apocalypse story line (in the comics) ran from March ’95 to June ’96. It features a bizarrely twisted future timeline in which David Haller (Legion) goes back in time to kill Magneto before he can commit any of his wide and various evil deeds. This action leads to the death of Professor Xavier, and then to Apocalypse attacking Earth sooner than he should have in the original time line (confused yet?). So with the timeline a mess, we get to see some of the “future” versions of the X-Men in this set. Dark Angel, Weapon X (Wolverine), Colossus, and others. It is no coincidence that this set is released just a few weeks prior to X-Men Apocalypse being released in theaters (May 27th). I would encourage anyone who has not read the Age of Apocalypse comic storyline to do so, well…cuz…it was awesome. However, I have a feeling that the movie adaptation will not quite match the book. How does something like this even happen? card is already in the works, due to the information being incorrect. Now, I am glad this issue was caught, and even more glad that Wizkids/NECA are issuing replacement cards in the near future. This kind of fix goes back to the old adage about an ounce of prevention is worth a pound of cure. 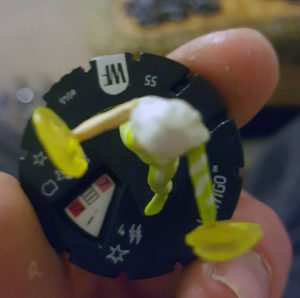 I would rather see WizKids/Neca spend the money they spend on “fixes” on expanding the HeroClix universe. There is not really any new game mechanics that were released with this set. We are seeing more “team” type Unique Modifiers, and lots of cool traits that are repeated throughout the sub-themes. So what is a “Unique Modifier”? The game definition is: Characters can only be modified by one effect of this name. A prime example of the use of the Unique Modifier is with this trait: “All New, All-Different X-Men Unique Modifier– When this character is healed by the X-Men team ability, modify its combat values except damage by +1 until your next turn.” Which means that even if a character is healed more than once via the X-Men team ability, the combat values will still only be modified by +1. The Freedom Force and Marauders sub-themes also have a new trait associated with them. Freedom Force- When this character is given a move action, after actions resolve he can use Force Blast as a free action. Marauders: Mutant Massacre- The first time during your turn that one or more opposing characters are KO’d, after actions resolve choose one: this turn modify this characters speed, attack, and damage values by +1; -or- heal this character of 1 damage. I think both traits are terrific, but not overpowered. If played well, both will have a bit of an impact on the match. The other item worth mentioning was the “+ X pts” option that was introduced in the Civil War gravity feed set. This option continues throughout the Prime figures of the Uncanny X-Men. Basically, if you pay an additional 5-10 points during force construction, when the non-prime version would be KO’d you may bring in the Prime version of that character on its last click, and cannot be healed this game. This could be a game changer. We saw a bit of a shift in the last two sets with the character point values being a bit lower overall. The Uncanny X-Men set continues that trend. From what I have seen, the highest point figure in the set is Phoenix (Prime) at 250 pts, while I would put the average point value of the set as a whole at 75 points. There are only three figures that are 200 points or more in this set. Even the highest point Chase figure is only 150 points (Magneto). Additionally, it seems that the “Power Creep” that is the bane of many games, (video and table top) is being addressed. The attack value vs the defense value has remained relatively consistent between Batman v Superman and Uncanny X-Men. Even as recently as the World’s Finest release, attack values as high as twelve were a bit more common. There are only two figures that have a top click attack of twelve in the Uncanny X-Men; and honestly considering those two figures are Weapon X (Wolverine), and Sabertooth/Wild Child, it is not out of place. Conversely, those two characters have a printed defense of seven-teen with Toughness. So while they will bring the pain, your average opposing character has a chance of hitting them. I think that these bases are very cool, and do bring some needed visual appeal to character traits. As I gaze into my crystal ball, I foresee a few potential problems. First, is Quality Control. This has already been touched on above, what happens when the wrong base gets packed with the character that uses it? Second, replacement. Stuff happens, pieces get lost, broken etc. Since the WizKids Product Replacement Program is very limited, so are your options. You can buy a full ClixFX Base WizKids Accessory Kit, which (reportedly) comes with eleven bases, and retails at about $17; or you can go back to using glass beads. Personally, I do not like the idea of buying eleven of something when I need one. I suppose there is always the secondary market…wink wink…nudge nudge. All in all, the Uncanny X-Men set is well worth the time and money. There is plenty for players of every playstyle to get excited about. I will have to say the only big disappointment is Apocalypse himself not being part of the set. 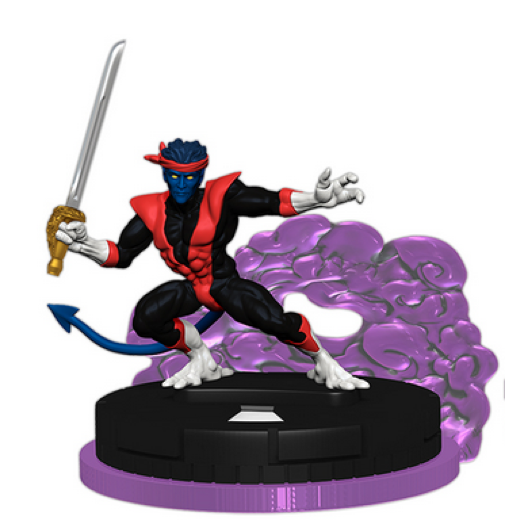 With Giant Sized X-Men no longer being considered “modern” there really is no option to recreate Age of Apocalypse on the HeroClix map. Nice writeup! Covers all the major points well with good observations. The only big ??? I had was re: this quote: “With Giant Sized X-Men no longer being considered “modern” there really is no option to recreate Age of Apocalypse on the HeroClix map.” Restricting yourself to modern figures is very unfun. Just sayin’. Thanks for the review! I totally agree J. I am not a fan of the “modern only” playstyle. At our local game shop we play “oreo age” (anything with an oreo base) most of the time. We do have Modern, Golden, sealed, draft, and OP events too, but we all prefer oreo age. Modern just cuts out way too much of our collections.